Location/Climate: On tip of Baldwin Peninsula of the Seward Peninsula, near mouths of Noatak and Kobuk Rivers, 549 air miles northwest of Anchorage. 9"/yr. precip., 47"/yr. snowfall, -52°F85°F. Population: about 3600 (75.1 percent native, mainly Inupiaq Eskimo). Travel Attractions: Kobuk Valley, Noatak, and Bering Land Bridge National Parks; Cape Krusenstern National Monument; and Selawik National Wildlife Refuge. Getting There: Scheduled air service from Anchorage and other points via Nome. Information: City of Kotzebue, P.O. 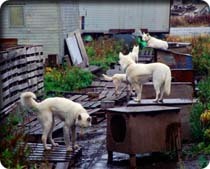 Box 46, Kotzebue, AK 99752, 442-3401, http://kotzpdweb.tripod.com/city/index.html. 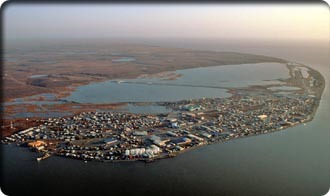 Located near the mouths of the Kobuk and Noatak Rivers on a narrow peninsula in Kotzebue Sound, Kotzebue has been home to Inupiaq Eskimos for at least 600 years. Traditionally named "Kikiktagruk," the camp was a center of Arctic trade long before German lieutenant Otto Von Kotzebue discovered it for the Russians in 1818. Today, largely native Kotzebue is the service and transportation hub for villages throughout the region. Its unique site and importance as a base and headquarters for northwestern public lands make Kotzebue a good choice for a visit. From here, you can easily reach points in Noatak National Park and Preserve, Kobuk Valley National Park, Cape Krusenstern National Monument, and Bering Land Bridge National Monument. Northwest Alaska Native Association Museum of the ArcticThis is where you can see the famous blanket tossone of Alaskas defining native images. There is also dancing, a multimedia presentation, and heritage displays. 2nd Street, open daily in summer, 442-3301, 8:30 a.m. to 5:30 p.m., $20 and worth it (considering the local cost of living). The museum is included in area tours offered by NANAs Tour Arctic, 442-3301. Bayside Restaurant, 303 Front Street, 442-3600. A cozy spot with a good mixed menu. Ice Cafe, Shore Avenue between Tundra and Lagoon. Features delicious ice cream, desserts, and fast food. Nullagvik Hotel, Front Street and Tundra Way, 442-3331. This is Kotzebues only notable lodging choice and a surprisingly good one. The fairly new and recently renovated hotel has very nice rooms and an excellent restaurant.